Get to know our host city, Tampere and the Venues for the WOMEX 19 programme. Tampere is one of the best-kept secrets in Northern Europe. Surrounded by two large lakes that give the city its distinctive air of natural peace, Tampere (pop. 232,000) is a vibrant regional capital with an active cultural life and a versatile event scene. A big city by Finnish standards, Tampere still manages to feel like a small town. In the compact city centre, everything is within a convenient walking distance. Tampere’s music scene far transcends the size of the city, both in volume and in scope. There are more live concerts per capita than in any other Finnish city. Over 30 annually organized music festivals cover almost every genre imaginable. Nearly twenty venues offer live music regularly. All in all, Tampere boasts Finland’s most vivid and versatile nightlife. The city’s tourist attractions include the landmark Näsinneula tower, topped by a revolving restaurant, the world’s only Moomin Museum, Tampere Cathedral with its iconic artwork by the symbolist painter Hugo Sim-berg, Tampere Market Hall, the idyllic Pyynikki and Pispala districts and the Pyynikki Observation Tower. Tampere boasts an impressive number of public saunas, ranging from the oldest to the newest public sauna in Finland, making Tampere the Sauna Capital of the World. The main venue of WOMEX 19 is Tampere Hall ("Tampere-talo Oy"), the largest congress and concert centre in the Nordic countries. Located only a stone’s throw away from Tampere city centre, Tampere Hall is within an easy walking distance from most accommodation options, the railway and bus stations and everything else Tampere has to offer. 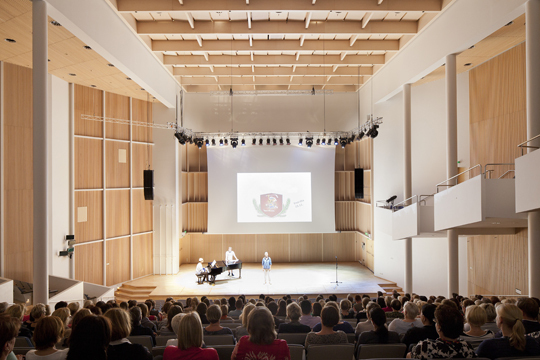 Tullikamari Cultural Center is Tampere’s premier live venue. Located next to Tampere Railway Station in a stunning former customs house built in 1901, Tullikamari is divided into two spaces: the larger Pakkahuone Concert Hall and the more intimate Klubi. The distance from the main venue Tampere Hall to Tullikamari is only 400 meters. Paja Kongressi is the congress wing of Solo Sokos Hotel Torni Tampere, one of the city’s landmark buildings, opened in 2014. Paja Kongressi is located in an impressive turn-of-the-century locomotive depot next to Tampere Railway Station. The distance from Tampere Hall to Paja Kongressi is only 350 meters.